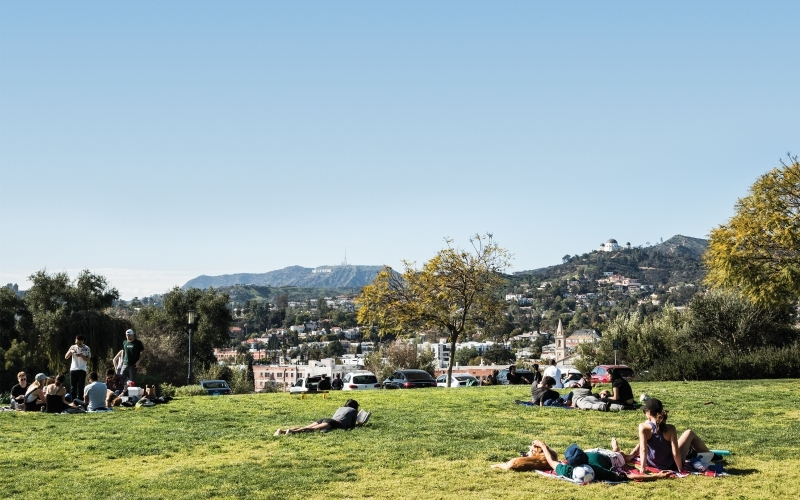 From grassy slopes to a hilltop swing, these L.A. parks are the best places to kick back and take in (and photograph) the view. It’s a two-for-one feast for the eyes. From the edge of Barnsdall Art Park you can gaze at a sea of treetops and the DTLA skyline; turn around and goggle Frank Lloyd Wright’s Hollyhock House, which sits on the property. Take a $7 docent-led tour of the abode’s interior Tuesdays and Wednesdays and of the exterior Thursdays through Sundays. Or wander the halls of the Los Angeles Municipal Art Gallery free of charge. See it all at sunset during one of Silver Lake Wines’ seasonal Friday night tastings. 4800 Hollywood Blvd., East Hollywood. Fair warning: You may have to patiently hover a while before getting your chance to sit on the park bench at Vista Hermosa. But the wait is well worth it. The seat comes with a stellar view of downtown’s skyscrapers and is framed by trees and other greenery (designer Mia Lehrer really knows what she’s doing). Once you’ve asked a stranger to snap that iconic ’gram, spend time exploring the park’s waterfall and meadows or set kids loose on the larger-than-life turtle sculpture in the children’s garden. 100 N. Toluca St., Echo Park. Consider throwing on some athleisure because you’ll get a good workout on your way up to the top of Baldwin Hills. (The mile-long trail is punctuated with several flights of steep steps that make for some glute-centric cardio.) While your legs and lungs recuperate at the summit, your peepers will be rewarded with a 360-degree vista of the L.A. basin, the Santa Monicas, the San Gabriels, and Palos Verdes. Don’t neglect ogling the trail itself—the park is a habitat for native flowers and wildlife. 6300 Hetzler Rd., Culver City. If you’ve ever wanted to soar over the 110 freeway rather than be bumper-to-bumper on it, try out the secret swing in the city’s oldest (212 years) and second-largest (604 acres) green space. A tiny parking lot on Elysian Park Drive marks the entrance; follow a short trail for a few minutes, and you’ll come upon a rope swing hung from a sturdy tree. Climb on and have a friend give you a push to drink in DTLA views for days. If Frisbee is your thing, pack one and play the park’s Chavez Ridge Disc Golf Course before heading out. 929 Academy Rd., Elysian Park. Next articleThe Best Things to Do This Week in L.A.